Marcelo has tipped the PSG forward to eventually return to Spain. MARCELO BELIEVES FORMER Barcelona star Neymar will play for Spanish and European champions Real Madrid one day. Neymar only completed his world-record €222million transfer to Paris Saint-Germain last August but the Brazil international has already been linked with a sensational switch to Madrid. 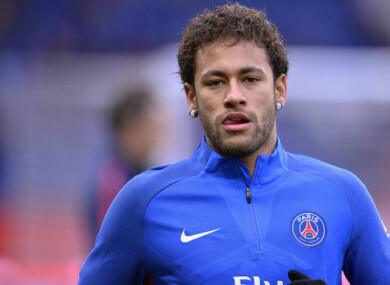 Madrid president Florentino Perez has previously fuelled speculation of a move for Neymar, while PSG captain Thiago Silva conceded he was unsure over the 26-year-old’s future in the French capital. And Madrid full-back Marcelo has tipped his Brazil team-mate to eventually return to Spain via the Santiago Bernabeu. “I think Neymar will play for Real Madrid one day,” Marcelo told Esporte Interativo ahead of Madrid’s showdown with PSG in the Champions League last 16 on Wednesday. Would Neymar fit at Real Madrid? He would fit, for sure. “It would be great if he came to Real Madrid. Neymar has starred for PSG this season, scoring 28 goals in 27 games in all competitions following his arrival from Barcelona. He scored the only goal as Ligue 1 leaders PSG edged Toulouse 1-0 on Saturday. Email “'I think Neymar will play for Real Madrid,' says Brazil team-mate”. Feedback on “'I think Neymar will play for Real Madrid,' says Brazil team-mate”.